The 753 code consists of three parts, spirit, body and mind. This is to guide you in life as you start out your Jiu jitsu journey. Pedro Valente always speaks about why philosophy is the most important part of the five elements of Jiu jitsu. Since 2010, I’ve trained at Valente Brothers, since that date Pedro Valente has alway spoken to his students about philosophy and its importance to Jiu Jitsu. Pedro’s Father, Dr Pedro Valente was the one that expressed the importance of philosophy to Pedro Valente. After Dr Pedro Valente passed away, Valente Brothers placed Dr Pedro Valente quote inside each Valente Brothers uniform, found on the tag of the Kimono. 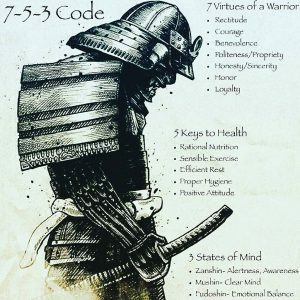 The Bushido code has been around along time, dating back to the Samurai, the code was used to guide the Samurai for centuries. Pedro Valente is the one that’s responsible for creating the 753 Code, it’s a simple way to help students remember each part. You can join the Valente Brothers on a Friday night at 8pm, Pedro Valente always gives a speech to his student and students can ask questions.